We are excited to once again participate in the Builders Association of Metropolitan Pittsburgh’s Festival of Homes. The Festival will be held over the next two weekends, September 22-23 and September 29-30 from noon to 5pm. 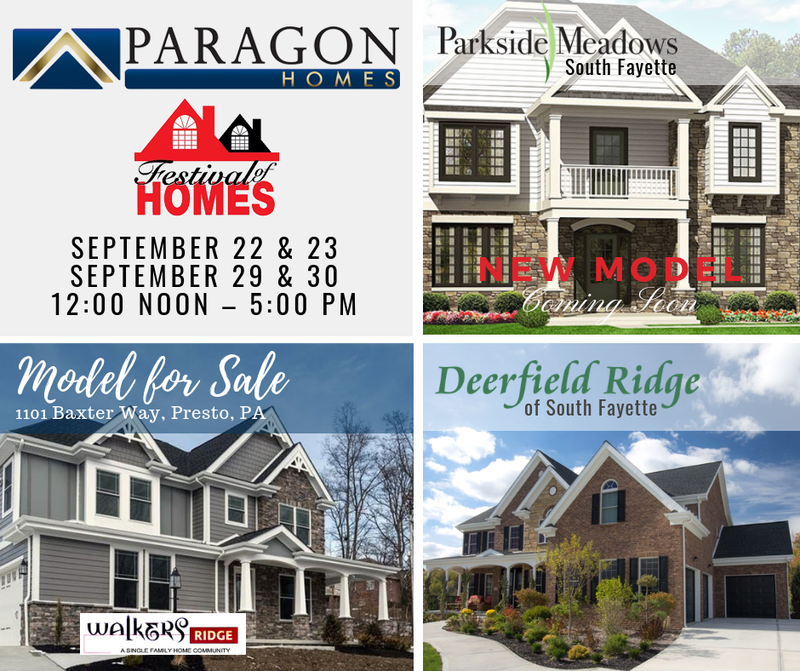 We are excited to participate once again in the Builders Association of Metropolitan Pittsburgh’s Festival Homes over the next two weekends, September 16-17 and September 23-24 from noon to 5 p.m.
Paragon will be featuring our Deerfield Ridge community in South Fayette and our brand new Parkside Meadows community in Collier Township. Parkside Meadows is a peaceful location adjacent to the township park and yet only 10 minutes away from plentiful shopping in Robinson Township and Bridgeville. We invite you to visit our model home at our Deerfield Ridge community to meet our family, learn about our commitment to quality and customer satisfaction, and learn more about Deerfield Ridge and Parkside Meadows. Join Paragon Homes THIS & NEXT WEEKEND for the 2015 Festival of Homes in Pittsburgh! On October 3rd and 4th & October 10th and 11th, over 50 home sites will be open, including some Paragon Homes properties, of course. The annual“Festival of Homes” is the largest yearly showcase of new and residential home communities, in addition to home renovations. 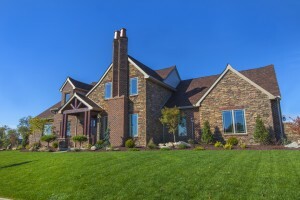 Paragon Homes, along with other leading new home builders in the Western Pennsylvania/Pittsburgh region, will open our doors, welcoming you to take in our beautiful home designs, unique custom styles, top-of-the-line technologies, and exciting layouts that we have to offer. 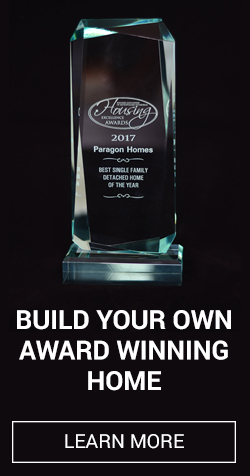 Visit our homes and building sites, and allow Paragon Homes to help you make all of your home dreams come true. We look forward to seeing you soon! Be sure to keep up with us on Facebook, Twitter, and Pinterest, too! On Saturday, September 20th & Sunday, September 21st, 2014, 50+ home sites will be open, including some Paragon Homes properties, of course. The annual “Festival of Homes” is the largest yearly showcase of new and residential home communities, in addition to home renovations. Paragon Homes, along with other leading new home builders in the Western Pennsylvania/Pittsburgh region, will open our doors, welcoming you to take in our beautiful home designs, unique custom styles, top-of-the-line technologies, and exciting layouts that we have to offer. Visit our homes and building sites, and allow Paragon Homes to help you make your home dreams come true. Admission is free, and you can tour homes from 12 noon until 5pm EST. Ashley Boynes-Shuck is a well-known blogger, author, and social media pro from Pittsburgh, PA. She was voted Best Blogger in Pittsburgh and Who to Follow on Twitter 2010, one of Pittsburgh’s Top 40 Under 40 for 2011, a 2012 Woman of the Year and Athena Young Professional awards candidate, one of Pittsburgh’s Most Influential Twitter Users by the Pittsburgh Business Times, and happily lives in a suburb of Pittsburgh with her husband, pugs, doberman, frogs, and cats! In her free time she focuses on advocacy and volunteer work, as well as rooting on the Pittsburgh Steelers! The weekends of Sept. 28/29 and this weekend, October 5/6, 2013, over 50 home sites will be open, including some Paragon Homes properties. The 2013 Festival of Homes is the largest annual showcase of new homes and residential home communities, as well as renovations. Leading home builders of the region, including Paragon Homes, open our doors to allow you to tour our amazing designs, styles, technologies, and layouts in the Pittsburgh Region. Check out our homes and future building sites for sale, and help us help you make your home dreams come true. Admission is free, and you can tour homes from noon until 5pm EST. Ashley Boynes-Shuck is a well-known blogger, author, and social media pro from Pittsburgh, PA. She was voted Best Blogger in Pittsburgh and Who to Follow on Twitter 2010, one of Pittsburgh’s Top 40 Under 40 for 2011, a 2012 Woman of the Year and Athena Young Professional awards candidate, and happily lives in a suburb of Pittsburgh with her husband, pug, doberman, frogs, and kitten! In her free time she focuses on advocacy and volunteer work, as well as rooting on the Pittsburgh Steelers!